I [infact we all at our place] just like hummus and it was only few months back when I finally succeeded in making this favorite dish at home. You can read about that recipe here. 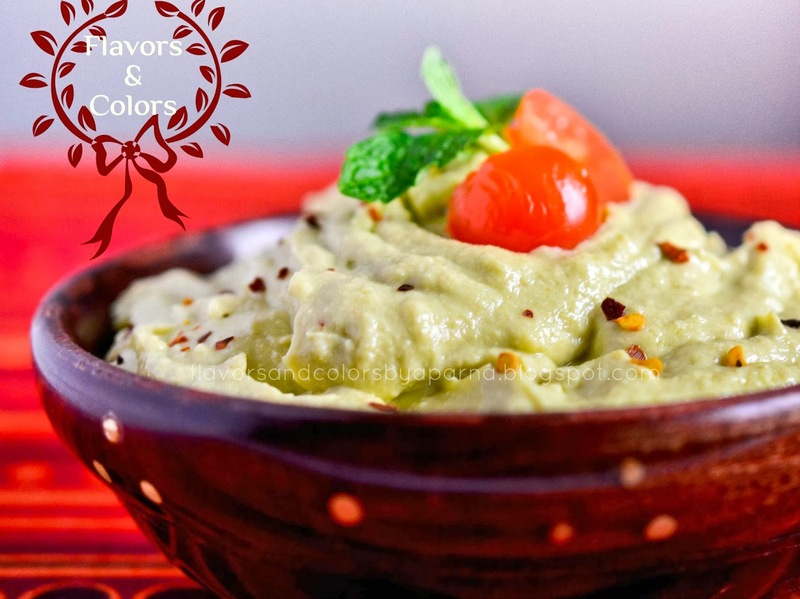 For me hummus is a low caloric, nutritious and a highly satiating snack. I love it for the countless ways we can use it in any kind of meal. There are n number of ways to flavor the basic recipe. 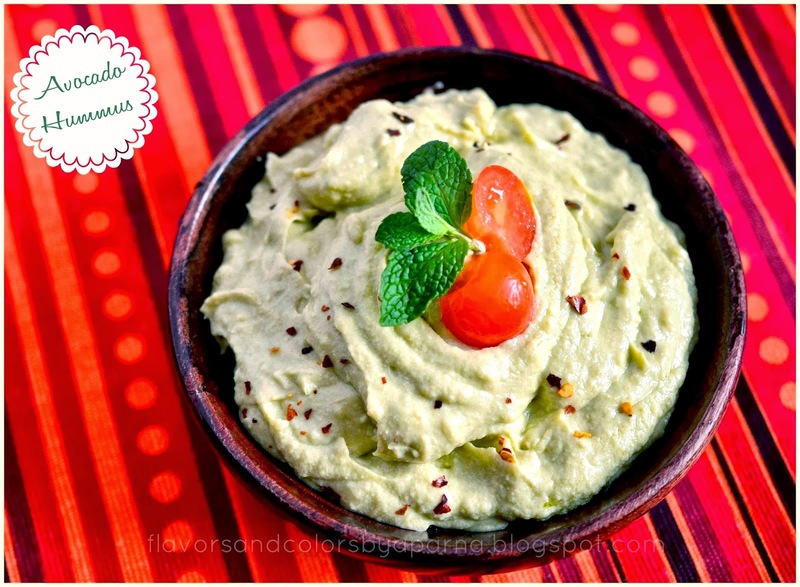 Today I am posting a version of hummus that's been flavored with avocado. In a way you can say this is milan of hummus and guacomole ;). 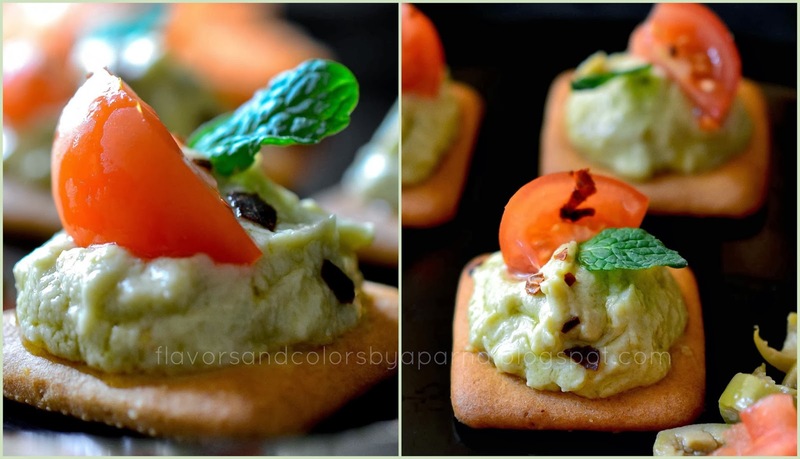 I topped it on crackers garnished with cherry tomatoes and mint leaves and served them as a tea time snack ! You can either follow this basic recipe mentioned here with addition of mashed avocado. For me the main ingredients were available in the form of paste and hence I blend all the ingredients together till I got the desired smooth texture. Take the paste in a bowl. You can serve them immediately or cover and refrigerate until ready to serve. Before serving drizzle some tbsp of olive oil, sprinkle some red chili flakes and garnish it with mint leaves and cherry tomatoes.